A healthy, consistent heart beat each quarter feeding oxygen into the system. Kurdistan and Baghdad unite as it pumps dinar through the healing body on a quarterly basis. The patient is recovering, Doc. Trying to wrap my head (the larger one) around what this phrase means ... . Thanks for taking the time to share, Synopsis. Shutting down the auctions this way is clever, especially if the corruption runs so deep. It is quite a rougues gallery of thieves and murderers that are being sanctioned!? This gives me insight into why Maliki has still been walking around in broad daylight. The Iraqi government wasn't able to take him on or out without taking on the Iranians, too. Also, on the financial side, US clout now tracks Iraqi finances and dealings with the IRGC and those dealing with them are now essentially outlawed. So, what happens with the currency auctions, now, as sales will be limited to friends, not foes. Seems like the is the power play for peace and prosperity in the ME with democratic goals. Maybe, I am naive to think this way? 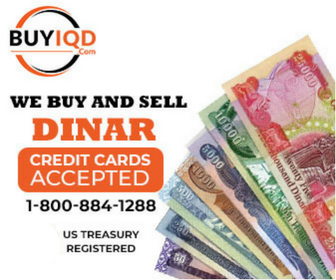 If you ain't making $$$ on the dinar, you should be making it on an oil ETF or Mutual Fund!? I think Sadr knows the Iranians are trying to ****** Basra (divide and conquer). So, his national agenda centralizes power within Iraq. Not necessarily a bad ideal to pursue, considering what we know about the disruptive nature of the Quds presence in Basra. Are 'dangerous files' code for Maliki and Iranian colonialism? Cheers, Ron. Thanks for taking the time to share. That makes a lot of sense. I am not a Forex trader, but I wanted to know what folks thought of this link: http://forex.tradingcharts.com/chart/US Dollar_Iraqi Dinar.html?tz=CST&chartpair=US%20Dollar_Iraqi%20Dinar&ctype=l&movAvg1=&movAvg2=&per=5m&sub=Save+%2F+Refresh Is this a new listing? If everyone is going to get a cut of the oil profits through the HCL, then a digital or paper payout needs to be cashed ... hopefully, in a bank account, or bank. Another step forward in getn organized for this eventuality.